Your community association prides itself on how beautiful and well maintained the common area is. But the owner of the neighboring apartment/condominium/home/property is from Planet “Who Cares”. The fence that borders your property is an eyesore, and the neighboring property owner refuses to talk to the board or management about the situation. Is there anything you can do? This situation is more common than you might think, and the answer is yes! 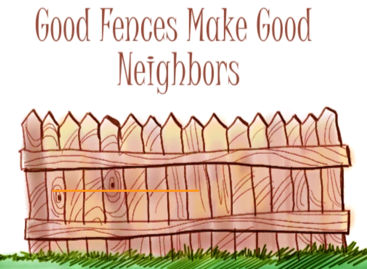 On January 1, 2014, the California Legislature updated Section 841 of the California Civil Code regarding “good neighbor” fences, a common fence dividing two properties. The original law, in place since the 1870s, simply provided that both owners were mutually responsible for common fences. As a practical matter, if your neighbor paid to put up a fence, you were obligated to reimburse your neighbor for one-half of the “reasonable cost” of that fence. If you paid to put up the fence, your neighbor had to reimburse you. As for how to agree on the cost of the fence and how to collect your half, the law was silent. You were on your own. The good news is that the new law does address these issues, and with more specificity. The 2014 law, like the 1870s law, operates on the presumption that neighbors benefit equally from a common fence, and that the cost for building or fixing a common fence should be shared equally even if the fence is on the neighbor’s property. But the 2014 law doesn’t stop there. It goes into detail, outlining a step-by-step process for erecting or repairing a common fence, and explains exactly how to recover half of the cost. The law also lays out exceptions to the equal-benefit, equal-cost assumption. You must send notice to the neighboring property owner or association at least 30 days prior to doing any work. Likewise, your neighbor must notify you if they begin work. No blindsiding allowed here, no putting up a fence overnight, like the Berlin Wall, and then expecting your neighbor to pay half. • A proposal for how to split the costs; and • A proposal for the timeline for getting the problem fixed. • If the costs of the project are the result of one Association’s personal aesthetic, architectural, or other preferences. None of the above factors are specific; they are simply guidelines. The courts are given broad discretion to split the costs of a common fence in any manner they view as fair. In extreme circumstances, a court could even order that one party must be responsible for the entire cost of the fence project. Can My Association Lien the Owner Next Door for Money We Expend? No, because there are no CC&Rs or law that addresses fees for neighbor disputes like this. But if the next door owner sues your association for half the cost and gets a judgment, they could record a judgment lien. Can My Association Recover Legal Fees We Incur to Resolve the Fence Issue With the Neighboring Property Owner? Again, No. In California and most states, the prevailing party in any lawsuit is only entitled to recover its legal fees and costs if there is a contract or statute that allows them to do that. Your association can collect legal fees and costs if it sues an owner that is part of the association to enforce the CC&Rs, because that is what the CC&Rs and the Civil Code provide. But if the other party is not an association owner, neither the Good Neighbor Fence Law nor any other law that I know of allows an association to collect legal fees and costs-even if it wins the lawsuit. 1. Failure to comply with the new law could jeopardize your association’s right to recover half of the cost. David Swedelson is a condo lawyer and HOA attorney. He represents associations. David can be contacted via email: dcs@sghoalaw.com. Special thanks to David’s assistant Linda Civitello for her assistance in preparing this post.